Looking to sell your business? Looking to buy a business? Visit https://www.adirondack.org/businesses-in-transition for more information! Clark's Marina was established in 1960. It is a year round full service Lakefront Marina Business, including boat sales, service, rental, & storage located on Fourth Lake in Eagle Bay between the Towns of Old Forge and Inlet in the Adirondacks. Includes 3 separate parcels totaling 13+ acres, 209 feet of direct lakefront, dock slips for 50+ boats, 27,000 square feet of storage warehouse space, 2 cottages, boathouse, office bldg, 3 Bay Service/Parts bldg with gas pump, Rental Boat Fleet, Launch Ramp and room to grow! Howard Hanna - Capital, Inc.
High traffic road, perfect for Office, Retail, Restaurant, Commercial, Manufacturing, etc. 2400 Square foot Building, new propane hot water boiler multizone heat, electric hot water, large high ceiling finished rooms, wood floors, 2 handicap restrooms, insulated 920 square foot heated shop space with 12 foot roll up door and fire code interior wall & lots of parking space, 240 feet of road frontage. This well established turn key year round business and well maintained property consists of 7 one and two bedroom vacation cabin units with kitchen and baths, office, owner/manager apartment, views and public access on Adirondack Lake across the road, all on beautiful wooded and landscaped grounds. Also included is a separate commercial office building on an adjacent separate lot, currently leased long term to NYS. This well maintained Indian Lake Motel & Apartment complex is now available for sale! Project includes 4 buildings, 15 total units, 11 Apartments ranging from Studio to two bedrooms, 4 Motel Units, Large landscaped 2+ Acre town lot, Public water and sewer, approved and subsidized by HUD, long term tenants with annual leases, large parking, 2 garages for storage, Outdoor Wood Furnace. Turn key established Lakefront Marina Business operation on Beautiful Indian Lake in the central Adirondacks includes Furnished 4 Bedroom year round house, Furnished 3 Bedroom Seasonal Cottage, Large Rental Boat Fleet, Gas Pumps and Above Ground Tanks, 33 Space Dock, Concrete Boat Launch Ramp, Mechanics Garage, Marina Store, Parking Lot, Grumman Boats Dealership and much more! Additional 2,9 Acre Lot with Large Storage Buildings also available. Owner Financing to Qualified Buyers. Commercial space opportunity in Indian Lake. High traffic road, perfect for Retail, Commercial, Manufacturing, or Storage Includes 3 Buildings, Retail/Showroom, Workshop/Storage, and a Newer 4000 SF Metal building, fully insulated with 16 foot ceiling, clear span, 6 inch concrete floor, all on 3 acres with 395 feet of road frontage, next to snowmobile trails, and nearby lakes. Chambers Common is a multi-tenant building with stores on the first floor, a two bedroom apartment on the second and there is a small, year round cottage on the property for rent or owner occupant. Located in the heart of Inlet, there are two very large spaces on the second floor that could easily be converted into two more apartments with town approval to maximize income. The two businesses that are currently for sale with the building are: "French Louie's" a clothing, equipment and fishing store and "The Adirondack Reader" and cafe. Both have been established since 2002. It has town sewer and it has it's own parking area. Inventory is additional. This waterfront property features 10 rooms all with lake views, 6 of which are rooms and 4 efficiencies. This is also the location of the only paid boat launch for the lake. It is a Four Season business. Property has had several updates in the short term, from new windows, furnace and water system. New carpets last fall.A stand alone generator is on the property in the event of power outage. This establishment has been in business as a restaurant and lodge for 42 years. Upgrades have been made throughout the building, including a new "3 season dining room". This business has a well built customer base, many of whom return year after year. This large, former hotel is located right in the middle of town, close to the public beach and not far from local stores and restaurants. They first floor contains a large commercial kitchen, a dining area, a library and a lounge. The second floor has 12 bedrooms and 5 full baths. The third floor has 4 large bedroom with en suite bathrooms. Recently renovated. This historic home is zoned for commercial and residential use. It was once the home to Perry's Country Store. It is the perfect location for a bed and breakfast, restaurant, store or more! It has 170 feet of lakefront directly across the street and has beautiful views of the lake. There are 6 bedrooms and 3+ baths, plus a living room, dining room, 2 kitchens, and the current store space and hot yoga studio. Listing does not include inventory for "The Well" coffee Shop. 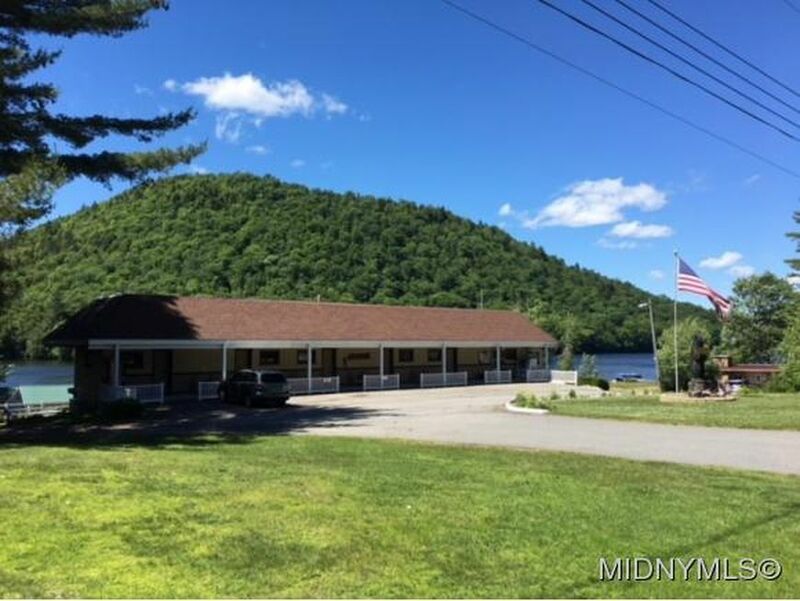 This Motel has a great location right in the heart of Speculator.The Motel is located with-in a couple hundred feet from the public beach on Lake Pleasant and the local diners. There is also easy access off the back property line right onto the snowmobile trails and Oak Mt. ski area is located just up the rd. The main living area has 6 bedrooms, 3 full baths, open living room,dining, and kitchen. There is a crawl under the home with an oil furnaces and there is electric heat upstairs.Plenty of room for your family to enjoy and have their own space. There is a separate office area for check-ins and a laundry/ storage room for sheets and cleaning supplies for the motel rooms. There are 10 motel rooms (8 with 2 full beds) (2 with Queen beds). The rooms have a refrigerator, microwave,t.v, sink and mirror in the room and a private shower and toilet area.There has been recent updating to the rooms and they are in very good condition. There is village sewer,water, and there is electric heat.The parking lot has plenty of room for parking. This is a great way to move to the Adirondacks and have your own business. Alicia C Miller Real Estate, Inc.
Great commercial opportunity. This property includes a convenience store with a deli and gas pumps, a liquor store, a 2 bedroom apartment upstairs, a storage barn, and a year round 2 bedroom cabin on a separate lot. The store includes 2 new deli coolers, a pizza oven, refrigerators, coolers, and lots more. Located at a major intersection, this huge, historic, multi-use, two-story building also has an apartment and /or office space on the second story. There is also a glassed-in porch upstairs and two expansive attic (storage) areas & exiting to second floor. Many rooms to accommodate your business. This turn key operation is approved to seat 62 inside and 30 outside. It is an ideal location for your business, It is in the center of the Village of Speculator, right at the junction of the two main roads in the county; NY 30 + NY 8. It features a cozy dining room, more seating in the main room outdoor seating,and 2(1/2) baths. This busy turn-key restaurant has been in operation for over 20 years, and what started out as a bar and pizza place has evolved into a full-dining favorite among locals and tourists. This once seasonal restaurant has grown into a year-round business with plenty of growth potential. A new walk in cooler was added in 2013. 2014 upgrades include; a new POS system, Big Screen TV, and a new grill, all add to the appearance and functionality. Onsite leased jukebox, ATM and pool table add ambiance and convenience. Unique commercial property, located in Long Lake near Lake Eaton State Campground. Currently being run as a Liquor store, Laundromat, and Unique Country Store. (Current tenants would consider leasing from a new owner). (Liquor store would consider selling inventory to a new owner). It has the potential to also be run as a gas station as it was in the past. Retail space is approximately 2590 square ft. This commercial site has unlimited potential!!! Easy parking/access and a nice location. Also included is an upstairs apartment with rental income potential, or as an owner residence. The Tamarack Cafe is in the heart of the charming Adirondack village of Inlet, NY. This profitable business has an outstanding CAP rate of 14! The Tamarack Cafe has been thriving for decades. This property is also the home of Inlet's only miniature golf course, Putterfingers. The restaurant and mini-golf course attract visitors from surrounding communities, campgrounds and motels in an often-bustling tourism area. The offering includes a five-bedroom, 1924 square foot apartment, currently used for employee housing, that could serve as an owner's residence or one or more rental units. The restaurant has additional outdoor seating and concessions available at the mini-golf course.